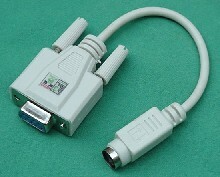 The KB232 PS/2 Keyboard RS-232 adapter allows a standard "PC type" PS/2 style keyboard to be connected to an RS-232 port of a computer or other equipment using RS-232 communications. The KB232 can be useful in embedded computing environments when PS/2 or USB ports are not available. The KB232 adapter can "steal" power from the RS-232 connection to power itself and a low power keyboard. It can also accept either +9 volt or +12 volt power from an external power supply. Custom keyboard mappings can be loaded to change the ASCII character (or characters) assigned to the keyboard keys. These are stored in non-volatile flash memory. To get a KB232 data sheet press: Get KB232 Data Sheet.